Divorce can be a long process, and things can get muddy. If not handled correctly, it can devolve into a case of he-said-she-said. This written agreement lays everything out clearly so that there is no room for uncertainty. When everything is written out, it makes it easier to proceed with minimal conflict. The settlement agreement can cover many things, and usually includes property division, debt division, spousal and child support, custody agreement, co-parenting plans, and any other relevant topics. 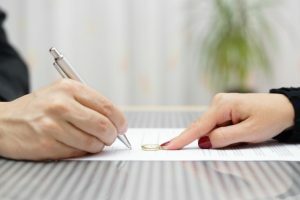 This agreement shows the court that you and your spouse have thought out the major issues concerning your divorce, which helps you proceed more quickly and efficiently through the legal system. While you can file your agreement at any time before the court makes its final judgment, it is typically filed along with the final judgment. When you need a marital settlement agreement in Tampa, turn to the capable attorneys at Hackworth Law. Call us today at 813.280.2911 to discuss your case. This entry was posted in Blog, Divorce on April 15, 2019 by HV SEO.